PLAYA NEGRA, Guanacaste — One quick look around the staging area at the Playa Negra date of the Guanacaste Surf Circuit (Circuito Guanacasteco de Surf — CGS), presented by Freestyle and Otis Eyewear, and you’d think you were watching a contest to pick the Costa Rica national surf team for the International Surf Association (ISA) World Championships. There was 4-time national champion Gilbert Brown of Puerto Viejo, our international kingpin Carlos Muñoz and his younger brother Alberto Muñoz from Esterillos, National Surf Circuit stars Anthony Fillingim from Malpais, Maykol Torres of Esterillos and Angelo Bonomelli from Puerto Viejo, and another former Costa Rica national titleholder Diego Naranjo, whose home is Jacó. His performance on Sunday did not go unnoticed by the big-name pros. The final featured Fillingim taking the lead from King early on with a powerful right. But then Tomas took a wave and did one vertical snap after the other, earning a 9.77 out of 10 that sent him far ahead of the pack. His competitors then would have needed combination wave scores to overtake him, which they didn’t have. Anyone who has spent time in Tamarindo recalls the young King going out into the local breaks with his father Brian. There were some contests, but they weren’t really a priority. All that changed after he went to the United States to try his competitive skills there. Upon his return, he began to train and surf more intensely. He entered the CGS between some international WSL Qualifying Series dates, where he’s getting into the rhythm of those high-level contests. The waves in Playa Negra over the weekend were, by consensus, “amazing,” barreling overhead from the start to the finish. There was a lot of rail and combo power surfing, as well as dips into those barrels overhead. The seasoned surfers loved it, but to watch the young “dolphins” (under age 12), paddle out and get pushed into what amounted to quadruple overhead for the tiny kids left the spectators in awe. “Those kids have no fear,” Naranjo commented. At 13, Serena Nava of Playa Grande is also fearless. She may have been bested on Sunday by pro Leilani McGonagle (Pavones) who won first place in the women’s category at the date, and Emily Gussoni (Jacó) who took second, but the youngster did well enough at the other circuit dates to earn the CGS women’s champion crown for the third year in a row. Nava, who had a harrowing childhood in Texas before settling with her father in Playa Grande, has a great attitude, especially about surfing. She won the Playa Negra date in the girls category (under 16), and ended up second place in that division for the year. On Friday, even before the CGS got started, 14-year-old Dean Vandewalle of Tamarindo knew he was in a good position to win the Boys division again, as he did last year. Not only was he ranked No. 1 before Playa Negra, but his confidence was high given that he holds three impressive spots in the National Surf Circuit rankings: No.1 in the grommets category, No. 2 in boys and No. 3 in juniors. Vandewalle stands out in a lineup, not just because of his cotton-white hair and special surfing glasses, but because he surfs like a monster twice his stature. The CGS has special significance given that he is an area boy. Yet he is incredibly humble, getting excited about winning but not placing inappropriate importance on it. At the end of the day Sunday, Vandewalle’s father Toni reflected on the growth in the CGS. Vandewalle senior noted that the level of surfing has risen quite a big, partly because of the fact that high-level pros show up and force everyone in the water to up their game. This weekend, in reviewing the scores, he noticed that there was an abundance of 9- and 10-point scores awarded to competitors. 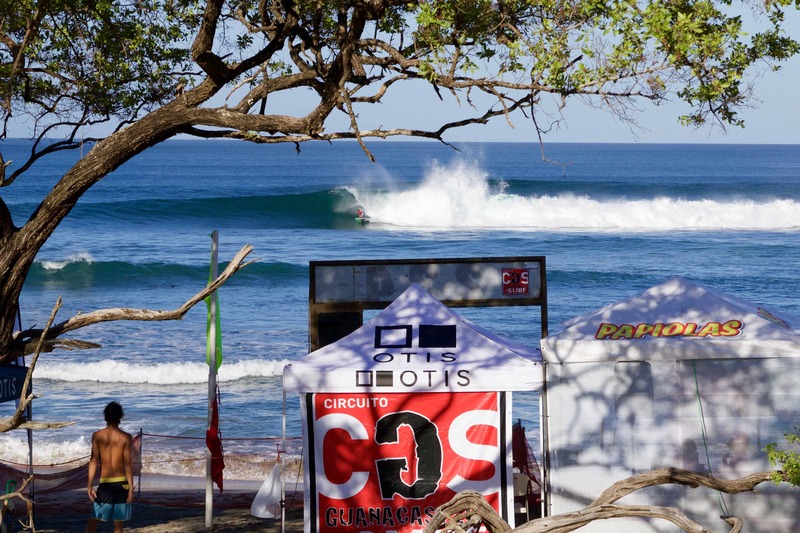 Additionally, there were several key factors that the CGS applied to carve out its place in Costa Rica’s competitive surf world. 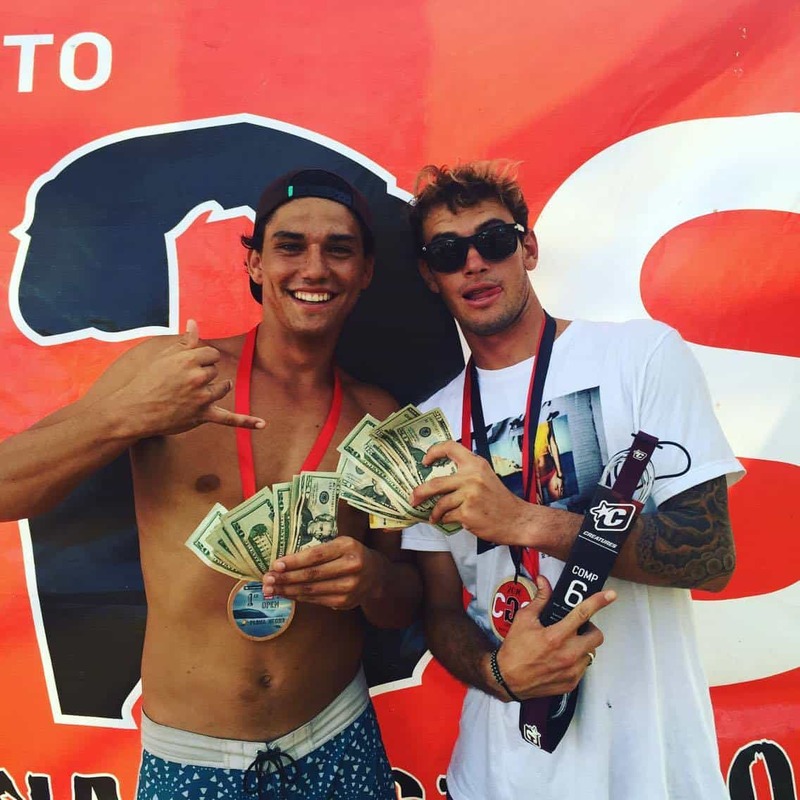 The $1,000 cash prize was a tremendous motivator, even though Maykol Torres, Albert Muñoz and Gilbert Brown all said they really came to Playa Negra because the waves were pumping. Vandewalle said the priority system, the signage on the beach that indicates who should paddle for the wave, has really helped improve the contest, taking “the dirty tactics out and putting the surfing up front.” He noted, too, that the CGS now has a live, computerized scoring system, akin to those in the professional leagues. “The judges make the scores, they go into the system and the announcer announces them to the beach, and more importantly, to the competitors in the water. They now have their scores and know what they need to do to advance. It’s also crucial that the public can follow along because the cheering changes the life of a surfer. This brings us up from the amateur to the professional level,” Vandewalle said. Finally, the judges are all ISA trained, either work with or worked with the National Surf Circuit and received judging clinics from Wade Sharp, the former Association of Surfing Professionals (now World Surf League) North America Head Judge and coach of the gold medal Costa Rica national surf team. “I think what we had this weekend was the best contest in Costa Rica,” concluded Vandewalle. Correction: A previous version of this story stated that Serena Nava won the CGS women’s champion crown once before this year. This is actually her third consecutive win. We regret the error.